PUBG Mobile recently arrived on the iOS and Android platform. It was a glorious moment for long-standing fans of the game on other platforms. Since it is now available for mobile, users have been reporting errors of PUBG Mobile Not Working. So we have a solution in this post so that you can start playing the game without any hiccups. It is not uncommon for Android and iOS games to encounter internet or network errors. The network error is generally due to the overload on a server. 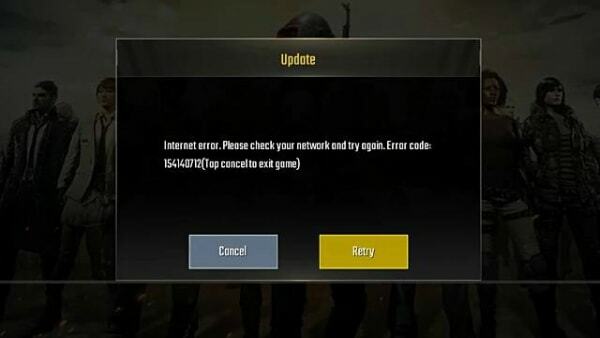 But PUBG Mobile works fine on most of the devices with only a small portion of users facing this error. There are two types of error: the network error and the Internet error. You can easily fix this issue, so there is no need to worry about that and these PUBG fixes are pretty straightforward. You are reading this article, so you may have encountered either of the two errors mentioned above while playing PUBG. It hampers the fun when all you’ve been doing is waiting to play the game on mobile. But we have a fix for these errors which we have explained below. This error has happened on both Android and iOS devices and it is mostly because of your poor internet connection. Other times, you will have to change the DNS server to fix this PUBG Mobile issue. On iOS, open Wifi from Settings and click on the “i:” icon. Select Configure DNS and tap on “+”. Enter the numbers “8.8.8.8” and “8.8.4.4” and tap on Save. For Android, Settings and then go to Wifi. Select “Manage Network Settings”. Simply change DNS1 and DNS2 to 8.8.8.8 and 8.8.4.4 respectively. Once you change the settings and apply them, PUBG Not Working error will be solved. This error will appear when you open PUBG Mobile and it will send you back to the home screen. This error happens because of the overload on a certain server. To solve this particular problem, you will need to download and use a VPN app on your device. If the servers of your location are down, then you will have to use servers from another area. This is where VPN comes in. It changes the IP Address of your device and tricks the servers into thinking you are playing PUBG from another country. You can find a lot of free as well as paid VPN apps on the App market. Download and install any one of them and open it. Now start the VPN and connect using any other country than yours. Once you do that, the PUBG network error won’t bother you anymore. So this is how you can solve the two biggest problems for PUBG Mobile Errors. Both the methods that we have explained here work fine and will solve your problem. Finally, we make it to the conclusion of the article on PUBG Mobile Not Working. We have explained the necessary fixes for the internet error and the network error. If you face any problems with the game, then get in touch with us at APKPie.